Even a very small business can decide to grant credit to its customers. Larger SMB's grant credit to customers as a way of doing business. About 1/6 of all the assets of U.S. industrial firms are in the form of accounts receivable so granting credit is a major investment in the U.S. today. Granting credit is actually the practice of making an investment in your customers. First, you have to decide what customers are worthy of that investment. Not all small businesses grant credit. Instead, they make all their sales on a cash basis. In many cases, this costs them sales and customers because, like it or not, we live in a credit-driven society. If a supplier needs to place a larger order from a company, that supplier may not have the funds to pay for it all in case. That order will go to another company unless your small business extends credit. Small businesses face a trade-off. They have to balance the costs of granting credit against the benefits of increased sales. Most small businesses have two types of customers. They have B2B customers or trade credit customers. Trade credit is simply extending credit to other firms. Small businesses also have B2C customers or consumer credit customers, which is the public. Terms of Sale: the terms of sale for a credit customer state how the firm will sell its products or services. Will the firm require a cash sale or will it extend credit? That decision is made through the process of credit analysis and determining who should be granted credit. If the small business decides to grant credit to a customer, then it has to establish terms. These terms will include the credit period and any discount you decide to offer the customer along with the discount period. Terms of sale may look like this: 2/10, net 30. This means that you offer your customers a 2% discount if they pay in 10 days. If they don't take the discount, their bill is due in 30 days. Credit Analysis: when determining credit policy, a company determines how they will grant credit to consumers and businesses. They use a number of methods to do this including pulling credit reports, evaluation of the 5C's of credit, and credit scoring. Collection Policy: if a company makes the decision to offer credit to its customers, it needs to develop a collections policy that it will use to monitor its credit accounts. Most companies use two approaches. They use the average collection period and the accounts receivable aging schedule. The average collection period (ACP)will let a business owner know how many days, on average, it takes to collect credit accounts. The business owner can compare the ACP to other firms in its industry and the ACP from other years. The ACP gives the business owner a wealth of data to work from. If the ACP is rising, then the business owner should take more aggressive collection action on its credit accounts. The accounts receivable aging schedule is a valuable tool as well. You can see at a glance what percentage of your credit accounts are late and how many are delinquent to the point of being considered uncollectible. 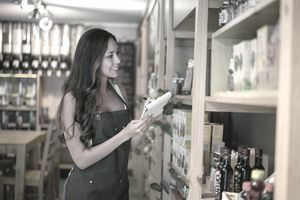 Between the aging schedule and the ACP, it's relatively easier for a business owner to keep an eye on credit accounts and fix any problems that might affect the firm's cash flow before they happen.